For those of you that have been following my blog for a while, you know that it’s been my aim to become the “Bake Sale Mom”; the mom that can do it and and bake it all. Let me tell ya that while I have conquered the cinnamon rolls and perfected my oatmeal raisin cookies & bread pudding (recipes coming soon), the presentation of some of my pastries are pretty sad. Ok they aren’t terrible but I just want them to be better. Practice makes perfect. Over the weekend I had a craving for a hot pocket but that’s not exactly a snack we keep stocked up in our freezer so I thought duplicating it couldn’t be that hard and would probably taste even better. 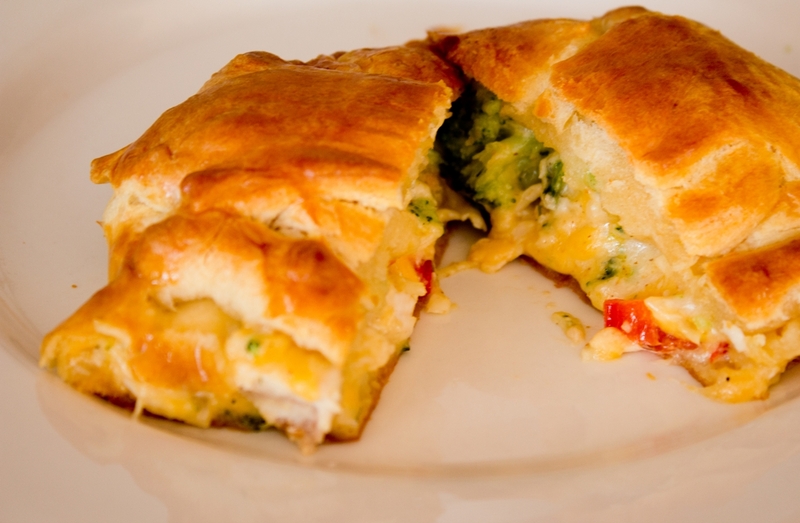 So I pulled out some ingredients from the fridge and went to work on these awesome Chicken Cheddar & Veggie Pockets. Not only did this turn out to be absolutlely delicious for Chief & I but even MJ loved it and asked for more. And when I say he’s the pickiest child to ever walk the Earth–even that is an understatement. This was a great change from the typical afternoon lunch and if you’ve been looking for some super easy kid friendly recipes, you might want to give this one a try. 1. Preheat oven to 400F. Remove crescent rolls from cans onto a lightly floured surface and roll flat. 2. 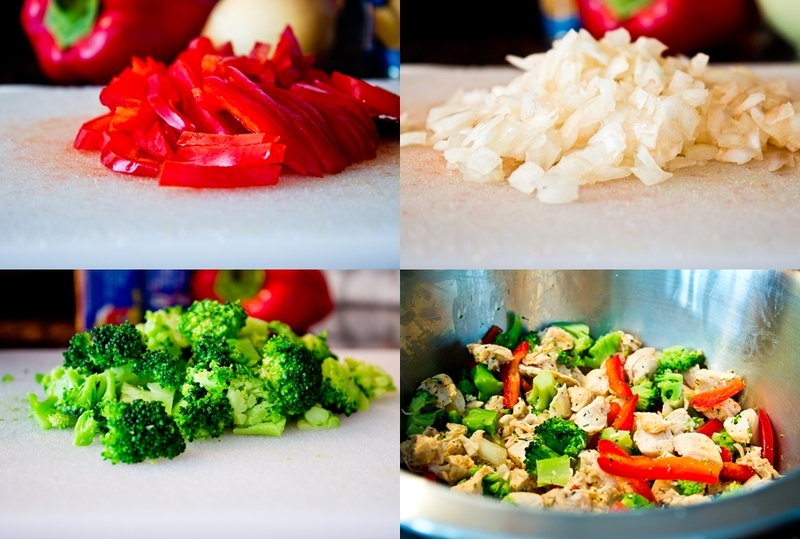 In a mixing bowl, combine chicken, veggies, cheese and cream cheese and mix until all ingredients are evenly integrated. 3. Place chicken filling in the center of the dough. Then fold the dough over the filling and pinch to seal the dough. You can cut the dough to make individuals pockets but I preferred to make two whole pockets and sliced them after cooking. 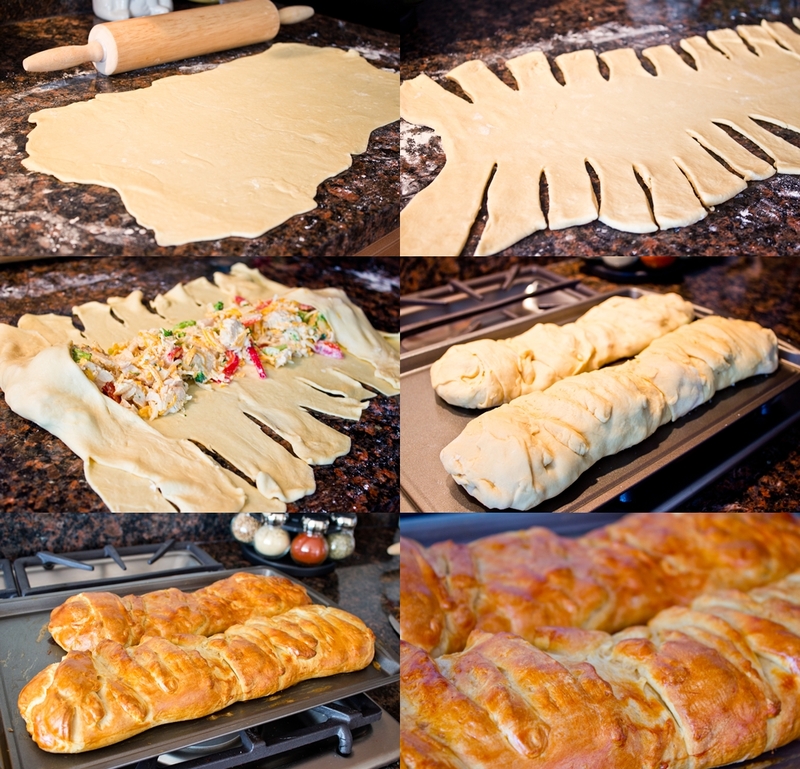 When I made these, I tried to get all fancy by cutting and braiding the bread as you can see from the pics. Try it at your own risk but I’m telling you here & now how I’ll be doing it next time. 4. Brush beaten egg onto the dough and place in the oven for 25 to 30 minutes or until golden brown. 5. Allow to cool for 10 min. Slice, serve, enjoy!